Programs provided on this page serve as examples for users of the Peter system. All programs are delivered together with the Peter system - now 145 example programs with full source codes in all. By clicking the icon situated in front of the program titles you will display the program preview screen. Peter's environment, as well as the programs created in Peter, is multilingual. Presently most of the programs are in Czech and English. Every program runs in language version according to the operating system (system option "Local settings") or according to the language of the Peter's environment, if this program is running from the Peter. Internal comments in this program are displayed according to the language of the Peter's environment too. Similarly multilingual are also names of the programs and library files and that's thanks to aliases of those files. 13 Ghosts - A logical game. Goal of the game is to get recipe for Becherovka. It is guarded by thirteen ghosts. Each of the ghost is keeper of one Carlsbad spring and permits passage only to those only ones who know solution of their rebuses. 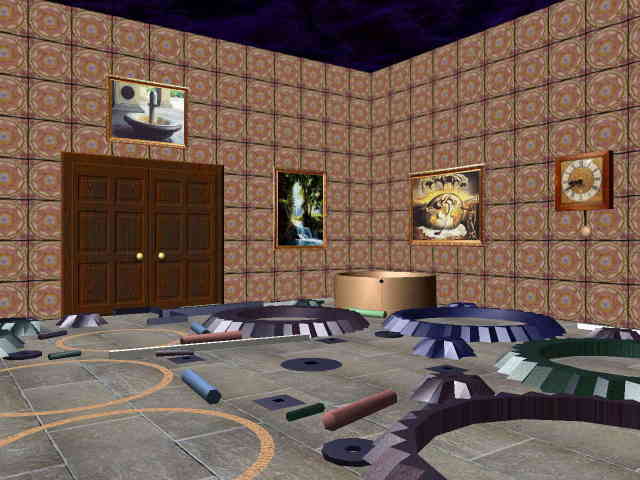 The game runs in full 3D environment and includes 13 stand-alone logical games. Airplane - demonstration of dynamic shadows. An airplane flies through a landscape. Altar - a simple 3D scene with altar and flickering fire. An example of how to use textures and combined control with a mouse and keyboard. 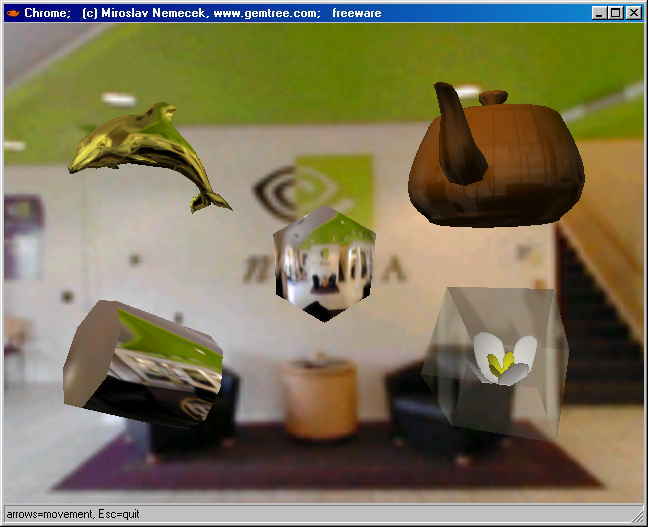 Chrome - demonstration of chrome and lens texture mapping of 3D objects. Crater - an example of simple 3D scene. You will appear at the bottom of a crater where you can walk in a little spooky moody environment with no less scary sounds (stereo). Descriptive - an example of using 3D graphics as a courseware. The program shows simple objects with their projections. Dragon - a simple 3D animation. A dragon frisks through the clouds. Horror - an example of 3D environment. You will appear in the land of monsters. Is is rather a theme for game with horror tinge. Orchard - the table of transparency types. A table need not always be only in a text or graphic form. This table is created in the 3D environment. It demonstrates various numerical codes for texture transparency adjustment. Penguins - rescue cargo of Becherovka! 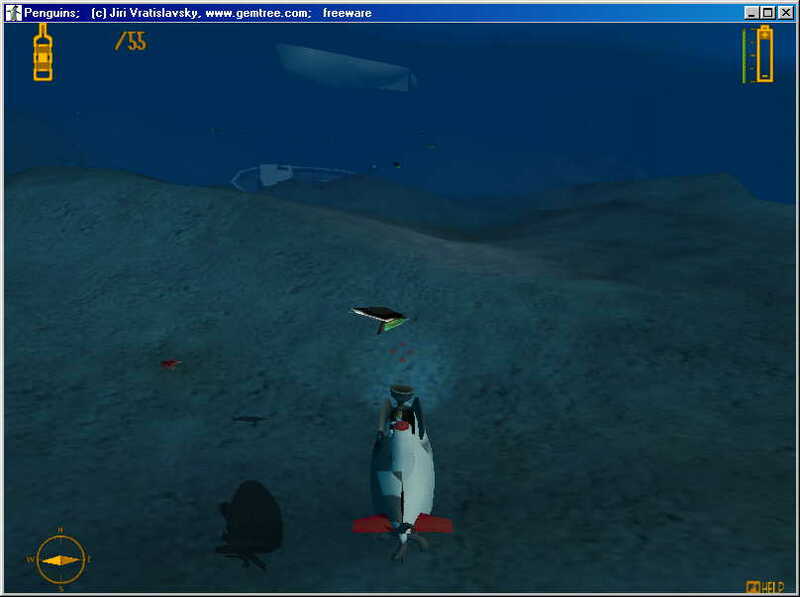 Using submarine you rescue flasks, which capture penguins from sunken cargo. Piece - demonstrates manipulation with the 3D objects. Rotating sphere, piece, and die will appear. Point 236 - action 3D shooting game. Your task is to capture back a curative spring. Many enemies attack you, all in full 3D environment. Sahara - search lost freight. Your task is to find a freight of tiberium lost in the desert. You have hovercraft armed by the detector of omega radiation. Full 3D graphics. Screen Saver 3D - a screen saver with 3D objects. You can choose from 11 types of objects. The camera is flying in infinite 3D space of them. The program can be examined without necessity of installing it as a screen saver. Is uses 3D interace OpenGL or DirectX. 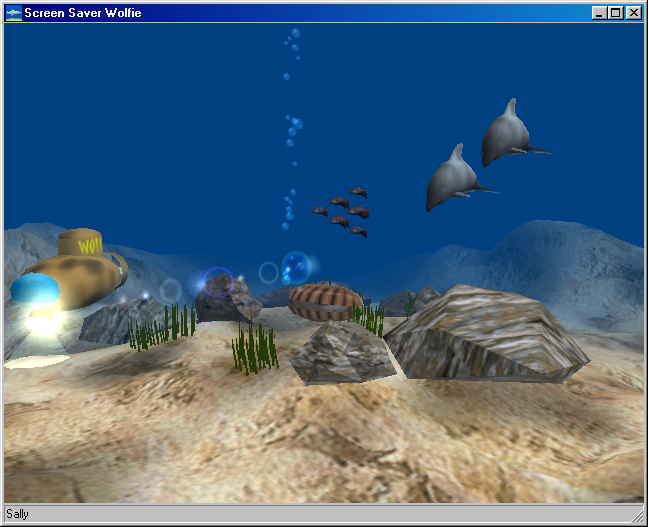 Screen Saver Wolfie - 3D screen saver with a beautiful undersea scenery with dolphins accompanied with music of Mike Oldfield. Demonstration od morphing and lens flares. Test 3D - a test of 3D graphics of the computer. With this program you can test abilities of your 3D graphics card (OpenGL or DirectX interface) and examine functions offered by the 3D environment of program created in the Peter application. Titanus - save the world! A 3D game, in which your task is to save the world against soldieries of monarch of the Titanus land. You have tank armed by phaser cannon and by self-repaired system. Turbo Cars - Car Racing. 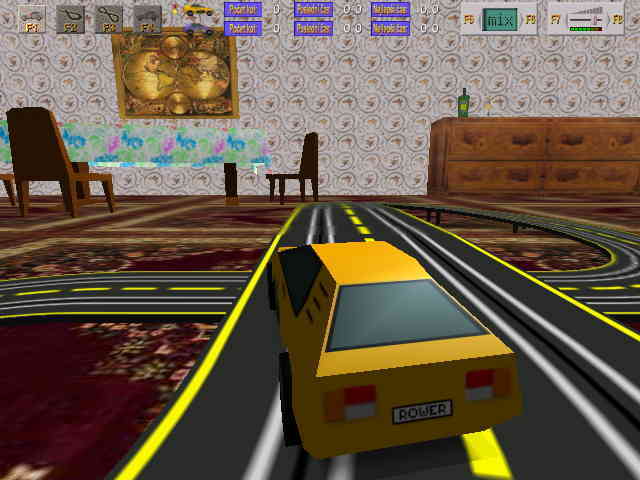 In the Turbo Cars game a player races with toy cars on a slot racing. Racing against computer, 2 players against each other, computer against computer and multiplayer racing between 2 players via Internet is possible. 5 cars and 6 tracks can be selected. The game runs in full 3D environment. Tutorial to 3D Graphic - tutorial lessons for working with 3D graphics. In 9 tutorial lessons you can familiarize with the basics of 3D graphics programming in the Peter application. After starting the program a demonstration of individual lessons can be performed. After opening the program by the Peter application (demo version is sufficient) you can view individual lessons together with their descriptions. Base - shooting down flying objects with a cannon. Butches - a network game for young bold fellows. The players fight against one another by means of a local IPX network or the public Internet network. Up to 20 players can be involved in this game. Each player can choose from 5 weapon sorts and 10 colors, or he can be involved in the game as a bystander. The running game can be entered or left any time. During the game the players may send messages to one another. Necessary to run the program is an installed DirectX driver, version 5.0 or higher, a videomode of min. 1024x768 (this is not a precondition), and a Pentium 166 MHz computer or higher. Monsters - Peter is walking through the labyrinth shooting the monsters. This is a demonstration program from the Peter application manual. Raptor - a classical action game. A plane is flying over the countryside shooting enemy planes. In the game there are 7 weapon types, 5 enemy types, and 13 compositions of the accompanying music. There are spatial sound effects. It can be controlled by a keyboard or by a joystick. Town - UFO destroying a quiet town. Sample of solution of random uncollision movement of the objects on the sheet. UFOAtack - annihilation of the UFO creatures attacking the Earth. A demonstration of utilization of sprites having a variable velocity and the option of switching the desktop according to the current video mode. Crossroad - simulates traffic on a crossroad. The semaphores are controlled by the SIEMENS-SIMATIC CPU212 unit via a serial COM port. Semaphores can be controlled manually, too (no control unit is needed), and so you can become a traffic policeman. IP Address - a display of a current IP address in the TCP/IP network (e.g. Internet). Very useful for playing network games. PicDev - developmental environment for onechip microcontrollers PIC16xxx. The program includes editor, compiler, and disassembler for PIC16F84 processor and compatible. A compiled program can be programmed immediately into the P84-CPU unit of the P84 construction kit, connected via a COM port. Program includes complete constructional recipes of the P84 construction kit, examples of end-applications, and detailed description of the PIC16F84 processors. This system is suitable especially for schools for teaching onechip processors. Most advantage of the system is a very low cost, easy use, and detailed documentation. The PicDev program is a sample of a half-professional application implemented in the Peter system and it is saved in a non-editable form (its source code cannot be viewed). Regulated Source - power supply controled by a computer. With a help of 2 transistors and some passive components connected to the serial port of the computer you can operate speed of train model or of LEGO model. Terminal - a terminal connected to the serial COM port. It enables setting parameters of the COM port (include control lines), sending characters written on the keyboard, and displaying received characters. It is very suitable especially for experimenting with a serial port or a modem. Filler - picture painting. This program, which is intended for little children, makes possible to fill areas of black and white pictures with colors. A part of it are 40 ready nice pictures to which further ones can be added easily. Graphic - a graphic demonstration. It shows possibilities and speed of the Peter system graphics - graphical commands, pictures, size change, mirroring, rotation, and picture brightness modification. Kaleidoscope - computer implementation of the popular kaleidoscope. Impressive chill-out diagrams. Modeller - modelling of rotational 3D objects. You will create a model profile a then you will display it as a three-dimensional rotation object. Possibility of saving in a file, loading from a file, a constituent are a few sample models. Displaying can be either software or using 3D interface. Paint - a graphic editor. It saves the picture in a BMP format file. Undo, redo, spray, filling, three-dimensional sphere, etc. Story-book from Abcs - an electronic edition of the fairy tale book by the writer Vaclav Deyl, accompanied by illustrations by the artist Miroslav Netik. The Gingerbread House - Peter tells the fairy tale about the gingerbread house. Fully narrated and accompanied by pictures - in English and Czech version. Addition Up to 10 - trials to add up to 10. Addition Up to 99 - trials to add up to 99. Calculator - a calculator with memory, accuracy of 15 digits, exponent. Conversions - units conversions. This program converts in both directions numerical values expressed by means of various physical units. On the whole there are 733 units, divided in 37 groups including the old Bohemian units. Easter Sunday - a computation of the Easter Sunday date for the years 1584 - 2100. Euler Constant - a calculation of the Euler constant to 1000 decimal places. It serves as an example of operations with accurate numbers. Factorial - a factorial calculation. It serves as an example of the console operation. Guesser - guessing a number. The program will guess a number you are thinking of, using maximum 10 attempts. The program author is a young user girl. Multiplication Up to 10 - trials to multiply up to 10. Multiplication Up to 99 - trials to multiply up to 99. Number in Words - transfer of a number into a text representation. The entered number is written out in a word representation (123 = "one hundred twenty three"). This is suitable for filling out money orders. Prime Numbers - a computation of prime numbers. Numbers from 1 till 9999 are tested on prime numbers and, as the case may be, unscrambled. This is a suitable example for using the dialog box and the list. Randomness Graph - display graph of incidence of random numbers and their sums. Graph is calculated by generating of random numbers and drawing results to the graph. Roman Numbers - converts numbers to Roman numbers and back. TI-59 - emulator of the TI-59 programmable calculator. The program fully emulates famous calculator TI-59 of Texas Instruments company with the PC-100A printer. It enables saving and loading of the programs and switching between library modules. It includes basic module "Master Library Module 1". Its memory range is 1000 program steps and 10000 memory registers. Tickets - computer verification of theoretical calculation. Specifically - what is a probability of punching all holes after marking one ticket in 3 different trams? CDBox - audio CD player. It serves for playing audio compact discs by the computer. Unlike other players it makes it possible to start and to close the player without stopping the running playback. JukeBox - a player of music and sound files. JukeBox can play WAV, MID, MP3, and RMI files, which it finds in the current folder. For playing MP3 files the installation of the MPEG Layer-3 Codec is necessary in some Windows versions. A constituent of the program are 10 sample MID compositions. Mini-Mixer - simple sound mixing desk. A sample of realization of a dedicated mixer. It demonstrates handling of control elements in a graphic mode and realization of a window without caption-bar. Mixer - universal sound mixing desk. It supports full facility provided by the operating system. MusicBox - a jukebox. It plays MID compositions that are a constituent of the program (28 compositions), displaying relaxing line patterns. Piano - a music instrument. You can play on the computer keyboard like on a piano. It contains 5 music instruments having a realistic sound (piano, sine tone, guitar, organ, violin). Easy key transposition. It displays the played tone frequency. It can be used for tuning music instruments or as a frequency standard. Very suitable for music tuition. Dice - a dicing for 1 till 8 players. The goal of the game is to gain 14 various dice combinations. Die - simple 6-sides die. Pexeso - the Pexeso game using flower pictures (32 pairs of cards). TV Tennis - classical televisual tennis, as many of you know it from the time of old televisual games. Dinner with Tejkl - a demonstration of a possibility of thematic photograph utilisation. Minigallery - a picture gallery of digital drawings and an invitation to the personal pages of the author Lukas Vlcek. Painting on Glass - an example from the creation of the students of the School of fine arts in Roznov pod Radhostem. Panorama - a panoramatic view of the town of Roznov pod Radhostem. The program is a sort of virtual outlook tower having an adjustable magnification. It is a demonstration of high resolution graphics (8000 x 1200 points) usage. The monitor resolution supporting up to 1600 x 1200 points is fully exploited. Photo Album - an example for establishing the own family photo album. To add your own new photographies full version of the Peter is needed. Poulicek - picture gallery of Milan Poulicek painter. Study - study drawings and an invitation to the personal pages of the author Lukas Vlcek. Thomas Gucky - a picture selection from the production of Thomas Gucky. Bathroom - you fossick with flash-lamp in the dark room. It is a little interference into Lucy privacy. Boring Dance - a trifle from the pikaware sphere, dancing Peter and Lucy. Butterfly - a display of sin function suggestive butterfly wings. Click - click there, where arrows point to. If you don't catch it, there's nothing the matter - it's only a little joke. Earthworms - you hunt colored earthworms running on the sheet. Flag - a fluttering flag. A demonstration of graphics and mathematics utilisation. Program displays 25 national flags. Flip-Flop - Peter and Lucy walk around the sheet and swap between them items from the sheet. It show work with items. Hop - Peter jumps over a tree. A trifle showing the sprite movement control. Jumps - great sportsman Peter jumps on skies from synthetic skiing slope. You can conclude wagers, how far he lands. Keys - a keybord test. An example of keybord usage. Lamp - lighting up a lamp with a key. Simple example of using logical flag. Lighting - Peter switches lights on and off in a house according to the preset number. A suitable demonstration for beginners. Lines - drawing lines. Impressively looking drawing of lines connected to a net. It enables automatic random generating. Magnifier - an expansion of the picture cut by magnifier. Illustration of using of functions for picture conversions. Maze - a tutorial of the Peter programming tool. Peter und Lucy look for the way out of the maze. The program is a part of the demo version. Miriam and Paul - an example of a wedding announcement. Molecule - example of solving of rotating 3D displaying of molecule model. Peter Has Dirty Legs - as a title says, childlike trifle, but nice. Pikaware - do you know, what is it pikaware and why are some of the Peter programs so significated? All of it you will recognize in this program. Radar - a simulator of a radar. Miniature with a humorous element. Siesta - Peter rests after Sunday lunch and savours several hours of organ concerts of J.S.Bach. Sinusoid - drawing a sine wave. At the same time, the sine wave is played in form of a tone. By moving the mouse the frequency and volume can be changed. Spiral - a snail shell is painted using a circles. You can rotate it in all directions with the mouse. Terumi - a small program by a Japan authoress. It is a laudatory recognition of the Peter system. Track - little cars leave a coloured trace on the desktop behind them. Walker - an example of the sprite operation. A likable little program in which a figure is walking randomly on the desktop, finding various objects. Water Surface - a simulation of mirroring and waving water surface. An example of an easy connection of mathematics an graphics. Water Surface 2 - another version of the Water Surface program. This time added nature sounds and floating ducks. Very suitable for relaxation - you will not believe, that you don't sit near the water. Xmas - Christmassy wish. A snowman frisks on the Windows desktop. Ants - card strategic game. You're building your own castle and trying to destroy enemy castle. Theme comes out from the popular Arcomage game. Becher Bar - business strategic game. You're buying bars, mixing and selling drinks and trying to survive in hard world of commerce. Very cool. Crates - a logical and combination game. The goal is to move the crates on the marks. The game contains 13 scenes. Crates 2 - additional scenes of the Crates game. The goal is to move the crates on the marks. The game contains 50 scenes. Eggs - a logical and combinaton game derived from the classical games "Revers", "Othello", "Tic-Tac-Toe". Fifteen - a classical game, the aim of which is to assemble 15 blocks. Logic - a logic and combination game. The goal is to guess the combination of pin colours. Pegged - a logical and combination game. The goal is to liquidate all pieces (except the last one) by jumping over them. Snake - version of the classic game Snake. The snake is creeping on the desktop, eating various objects. This is a demonstration program from the Peter application manual. Stones - a classical logical game in which you take stones. Who takes last one, loses. Train - a logical game of the Snake type. It practises accuracy, perception, combinational and logical thinking. The aim of the game is to collect all objects in the scene an to pass a gate. There are 50 scenes in the game. Execute - a command interpreter. It demonstrates the possibilities of starting other programs and the operation of a console. InfoCD - an information display about the CD-ROM. It detects the CD drive, prints the disk label, serial number, disk size, and the date of disk generation. InfoDisk - an information display about the disk. An example of disk and console operation. Screen Saver - Clock - sample of a screen saver realized in the Peter system. SysInfo - system informations. It displays common and detailed informations about operating system: system version, processor, memory, colors, videomodes, metrics and so on. The program is a sample for using DLL libraries and Windows API functions. Alphabet - tutorial of the alphabet for the smallest. Based on the pictures associated with the letters the children are able to learn the alphabet and try to write on the keyboard. Characters - a character table. Demonstration of font styles in dialog boxes. The size, colour etc. of the fonts can be changed by switch buttons. It is a useful program enabling to transfer any character from the character table into other programs by means of the Windows clipboard. Notepad - a simple text editor, a similar of Windows Notepad. It facilitates use of Windows clipboard and one-level undo. Speak and Type - typing for children. The task is to type the name depicted in the picture. Full sound distribution. Writing - a simple text editor. Suitable for beginners. Address Book - address survey. It enables storing addresses of your friends including their phone numbers, E-mail addresses, and arbitrary notes. The phone numbers can be automatically and immediately dialed through the microphone (by means of the tone dial). It ensures sending the electronic mail to the appropriate E-mail address. Autodrom - car races from the "bird's-view". After every lap one opponent joins. Car Races - 3D car races. This program is a specimen of creation a pseudo-3D graphic with help of the 2D graphic commands. It provides a realistic look of cars and landscape, 20 types of landscapes, 11 types of cars, a high-quality sound, a joystick. Carrot - the rabbit is singing and running to catch the carrot. Very favourite with children. It demonstrates the "backward programming". How can be programmed backwards in Peter? Press the TAB key, and you will see. Cimo Bike - a sales promotion program of the Cimo Bike Company: a bikers data basis, animation, a few of nice video sequences from the mountain bike history, calling the Internet. Freeware of the Cimo Bike program version on a CD with all video sequences (445 MB) is available at: Cimo bike, Mostecka 367, 75501 Vsetin, Czech Republic, phone 00420-604-178756. Close see program Cimo Bike description (only Czech version). Clock - a display of the current date and time. Desktop Games Christmassy - Christmassy version of the Desktop Games program. You're destroying Windows desktop again but this time with candy and snow gun. Digi - display of the current date and time. This is a user modification of the Clock program. Flowers - an encyclopedia of the most widespread flowers. It serves as an example for encyclopedia generation. Fortune - an oracle answering your questions. Hand Clock - clock with hands and owl. Hypno - hypnotising moving pictures. An example of displaying mathematical functions and working with files. Internet - a connection to the WWW page of Peter. An example of Internet operation. Joystick - a joysticks test. An example of joystick operation. A wiring diagram of the connectors and the joysticks for the basic mode 2 directions / 2 buttons. Suitable for implementing analog and digital inputs to the computer. Labyrinth - a maze. Peter searches the way in the labyrinth to save Lucy. It contains 20 scenes. Little Peter - a programming tool. Peter has a small son, called little Peter. He, too, can program. Using it, you can build houses and castles, even if you are perhaps only five years old. Moodes - 70 pictures symbolising various states of mind. It can also foretell the state of mind. Multi-License - a calculation of multilicense price reductions for the Peter program provided to schools. An example of a dialog box. P.F. - Christmas and New Year's wish, with which you can please your friends. In window title you can quote text of your greeting (add PF.TXT file). Displayed year is deduced from current date. Presentation - an introducing presentation of the Peter application. Spelling - a spelling of texts. The entered text is spelled (pronounced) according to a spelling table ("Alfa - Bravo - ..."). Very useful at codes saying by phone. Available in Czech and English versions. Tutorial - tutorial lessons for the basic familiarization with Peter. Zodiac Sign - describs character and other traits of people according to the zodiac signs under which they were born. More than 50 new example programs added into groups 3D Graphic, Pikaware, API Pikaware, in version 2.30.